If you select Reboot and Delete without query, in The File Unlocker for Windows 10 or 8.1, and Windows 7. See also ✐ ... for what, I am an expert and I know what I am doing? (Image-1) Reboot and Delete whiteout query, in The File Unlocker! 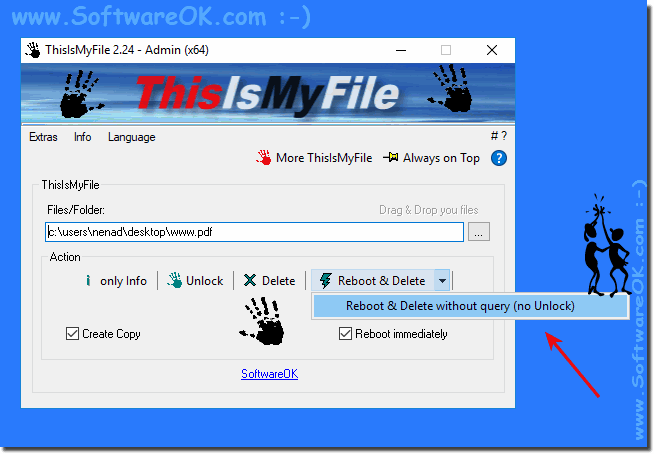 ThisIsMyFile - FAQ-3: Reboot and Delete without query, what does The File Unlocker then? The ThisIsMyFile File Unlocker is a professional program that I use to unlock locked files and folders on the Windows-10 system. But! Delete to remove the selected file or folder is the right away, while reboot and delete, and reboot and delete without query, do so at windows system delete all files, please explain me?